Next to the neat rows of vines, an elephant statue stands, trunk raised and curled, facing the unusually turquoise copper-clad building. I arrived at Elephant Hill under a bright blue sky and met Louise from Tourism New Zealand, who’d literally just flown in from Auckland. We’d be travel buddies for the rest of the trip. You know those gloriously sunshiny days when you step out of the office at lunch time and find yourself wishing with all your heart that you didn’t have to go back indoors to your desk? This would’ve been one of those days. 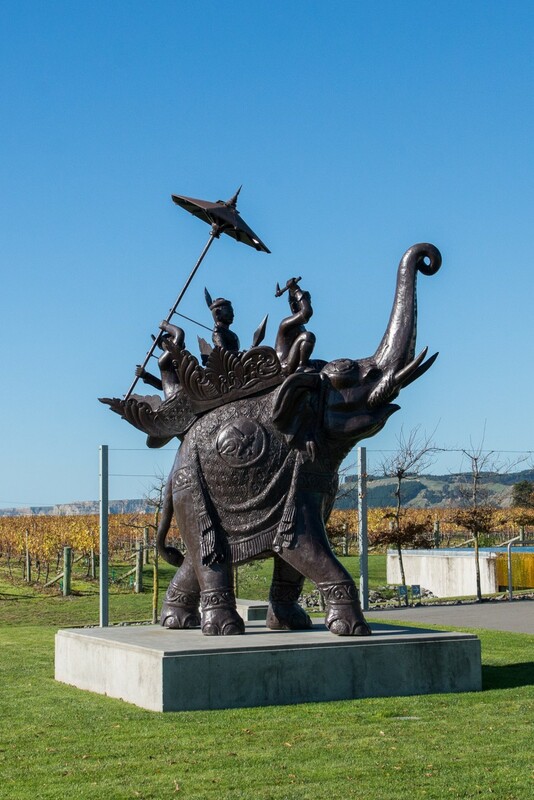 Elephant Hill was established by Reydan and Roger Weiss, who fell in love with the natural beauty of Te Awanga and Hawke’s Bay when they visited from Germany back in 2001. 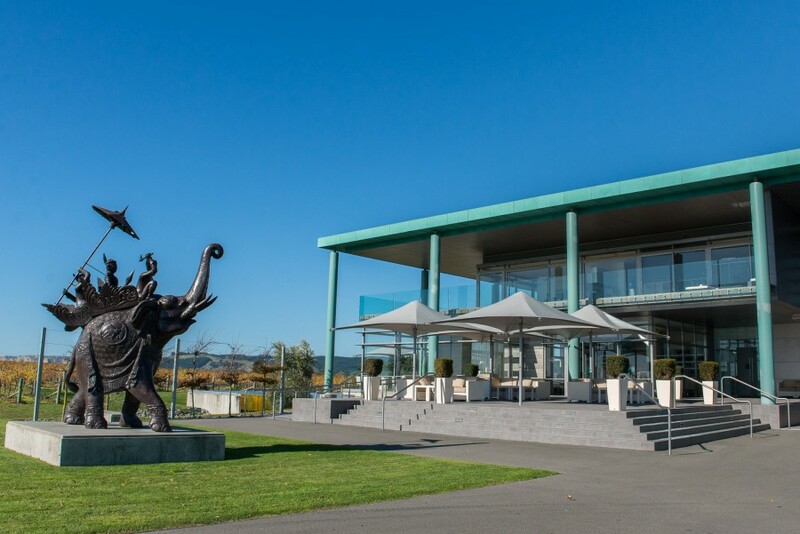 The restaurant and cellar door are surrounded by the estate vineyards that span over 25 hectares, making for stunning views as you wine and dine. 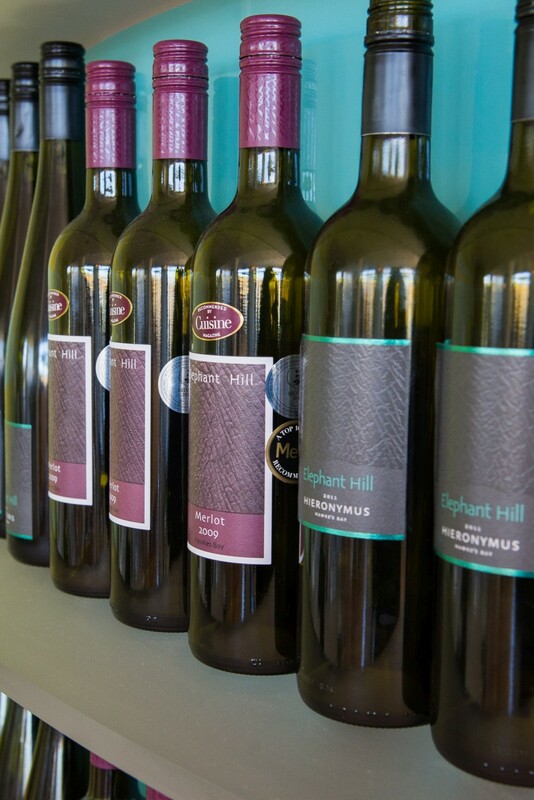 Louise and I joined Elephant Hill’s Marketing Manager Vince Labat for a wine tasting. In between tastings of 2011 sauvignon blanc, 2012 pinot gris (my favourite of the bunch), 2012 Gewürztraminer, 2012 rosé, 2011 pinot noir and 2009 syrah, we admired the distinctive bottle labels with elephant skin print. 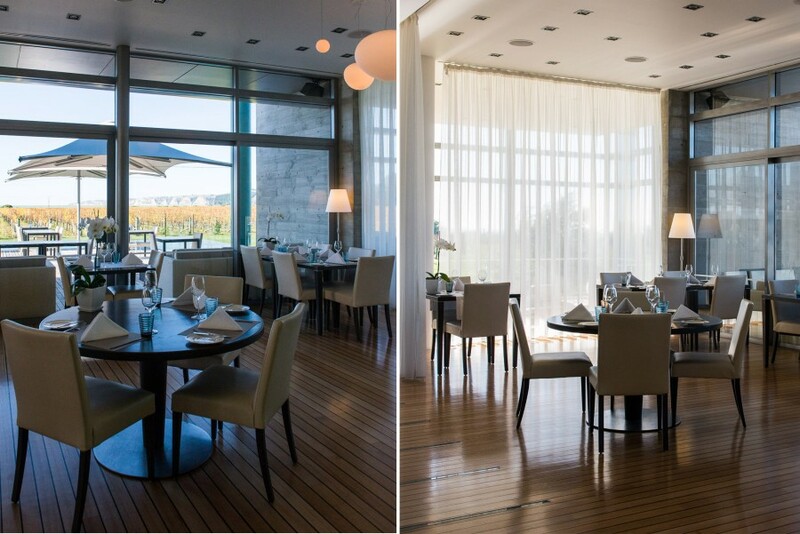 Inside the restaurant, the dining spaces are airy and make good use of the natural light, with well spaced tables. 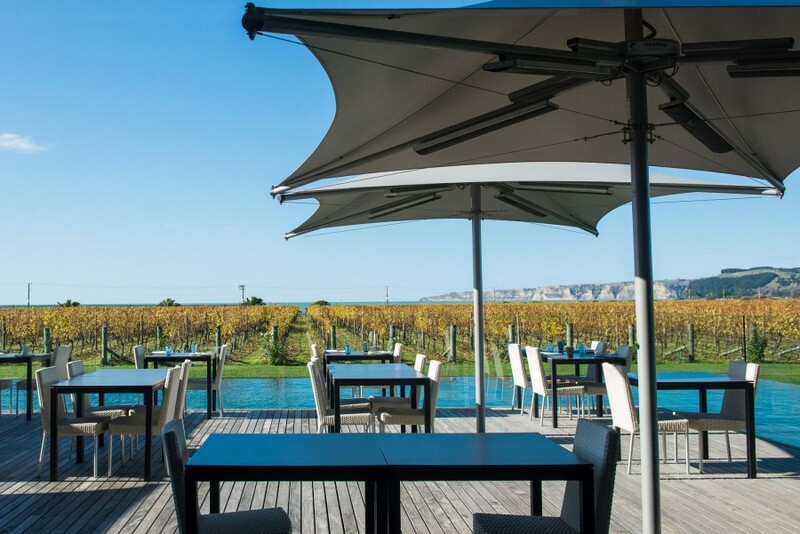 Out on the deck, there’s sunshine to be soaked up or shady umbrellas to hide underneath, with gorgeous views of the vines, the sparkling infinity pool and Cape Kidnappers on the horizon. Lunch time! 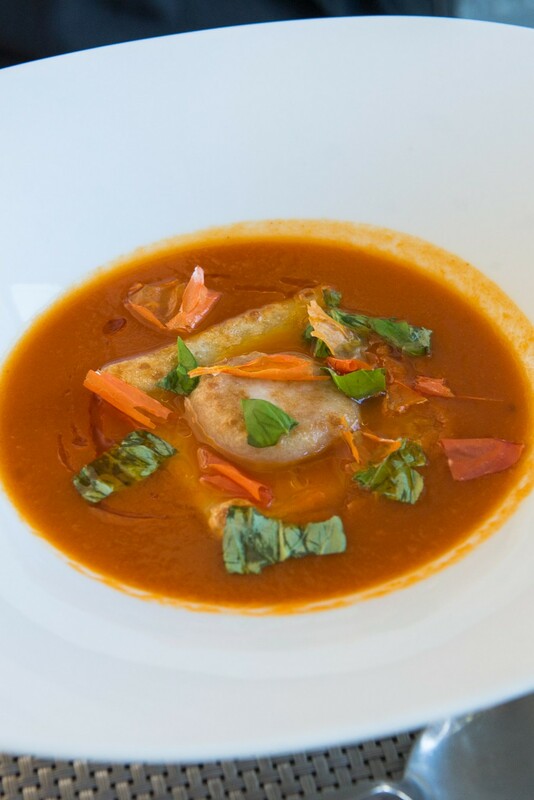 For her first course, Louise ordered the roasted tomato soup with olive and feta gnocchi raviolo, tomato oil and basil. From across the table, I breathed in the aromas of spiced tomato and torn basil leaves. I chose the inked salmon, lemon creme, caper berries, tomato leaves and citrus pearls. It was a substantial entree, with 3-dimensional sculptural construction, lots to discover and dismantle. 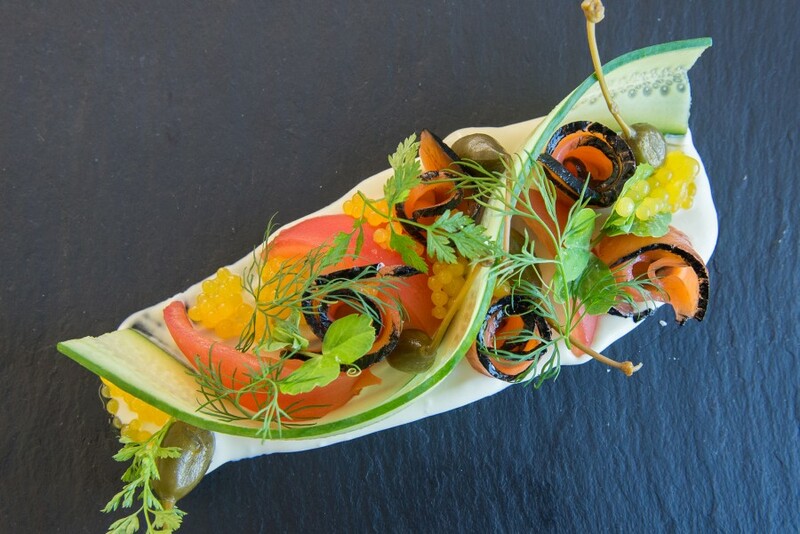 It all went very well together – the thickly sliced salmon with black squid ink edges, zesty citrus pearls that popped like caviar, the tart lemon creme and mustardy caper berries. 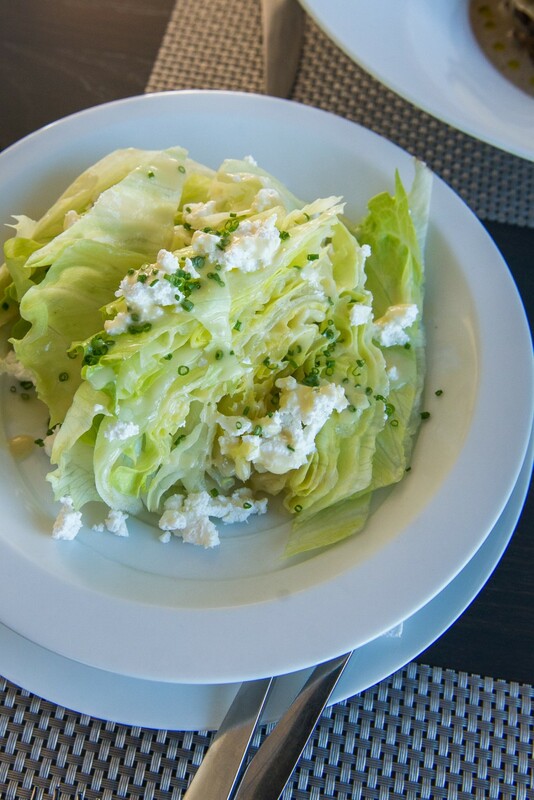 To go with our main courses, we shared a salad with iceberg lettuce, crumbled feta, finely chopped chives and champagne dressing. It was superb in its very simplicity, and we both couldn’t stop eating it. Yes, I know – imagine me willingly devouring a plate of lettuce with no bacon involved! 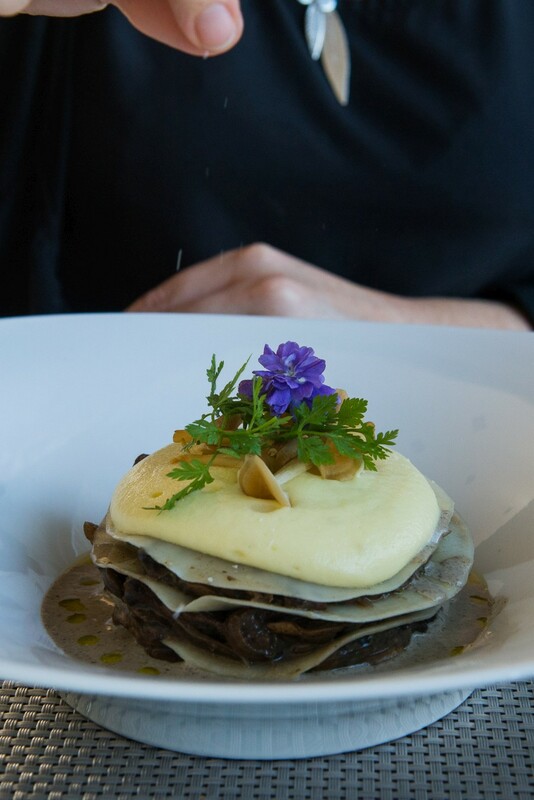 Louise’s main course was the open ravioli, organic mushroom ragout, potato mousse, truffle cream. Mushroom lovers would be delighted with the layers of organic mushrooms and pasta sitting in a rich mushroomy broth. Once again, I sat across the table shamelessly enjoying the gorgeous smells from Louise’s plate – truffle and mushrooms. My main course was the whitefish (today, blue nose), warm corn custard, crab tortellini, vanilla and saffron fumet. The vanilla I could’ve done without, but the blue nose was cooked beautifully, the crab tortellini sweet and tender. The best thing on the plate was the warm corn custard, silky soft like panna cotta. 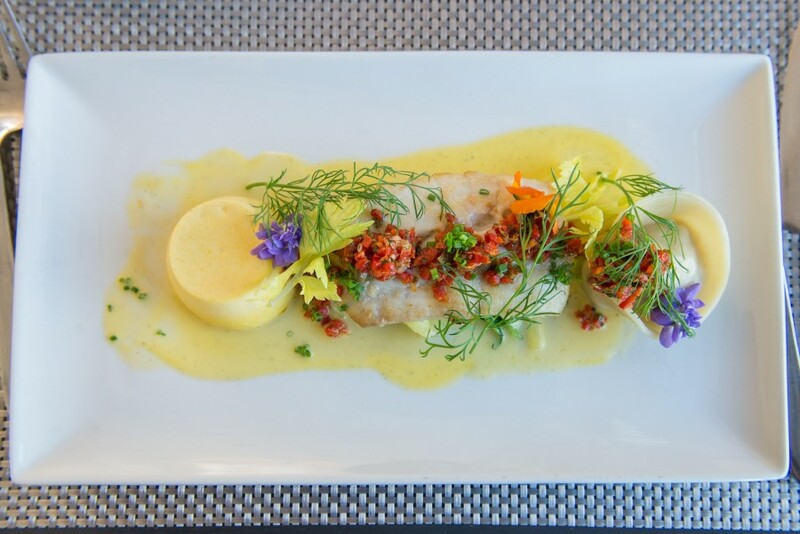 Artistic, elegant plates of delicious food and wonderful views… it doesn’t get much better than this. 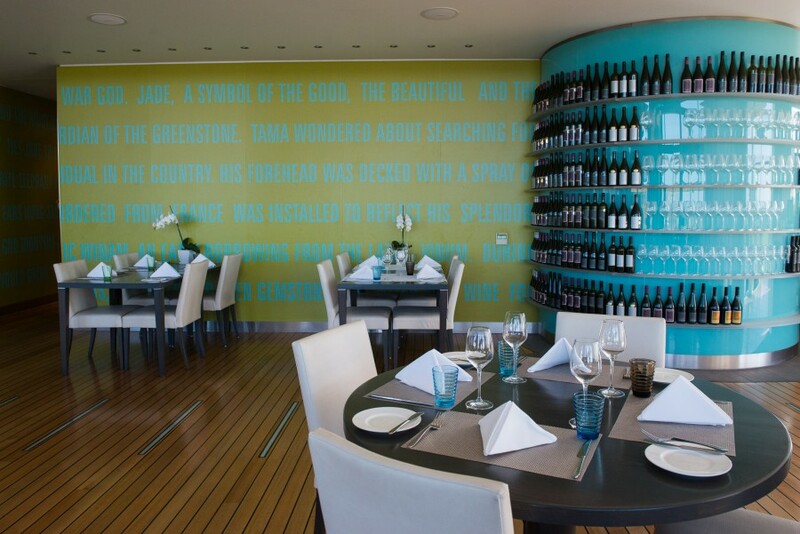 The menu includes matching wine suggestions for each dish. I recommend a leisurely paced visit with an elephantine-sized appetite. 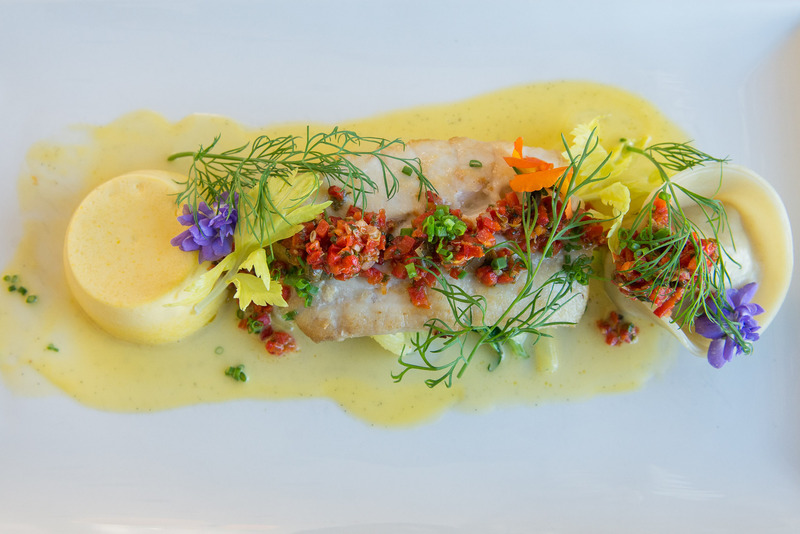 I travelled to Hawke’s Bay and dined at Elephant Hill as a guest of Tourism New Zealand. The Food and Wine Classic, referred to as F.A.W.C! 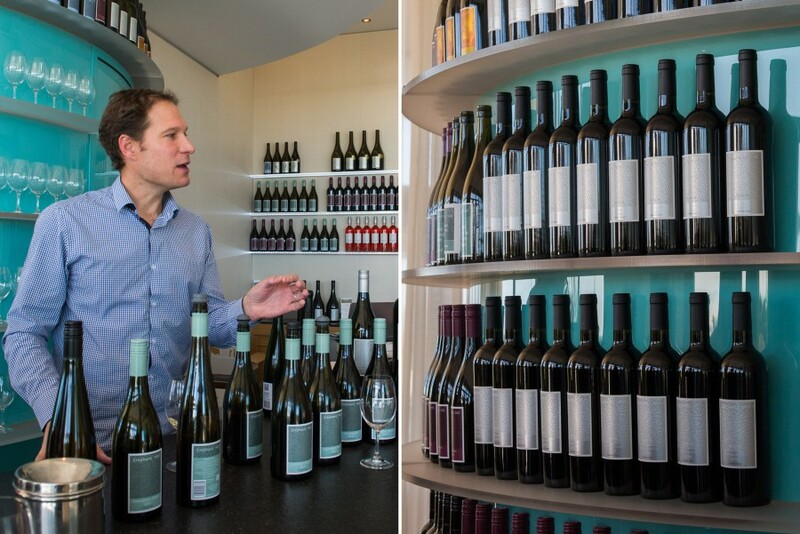 (pronounced ‘fawk’, rhymes with hawk), will see over 50 food and wine experiences held over 10 days in Hawke’s Bay. 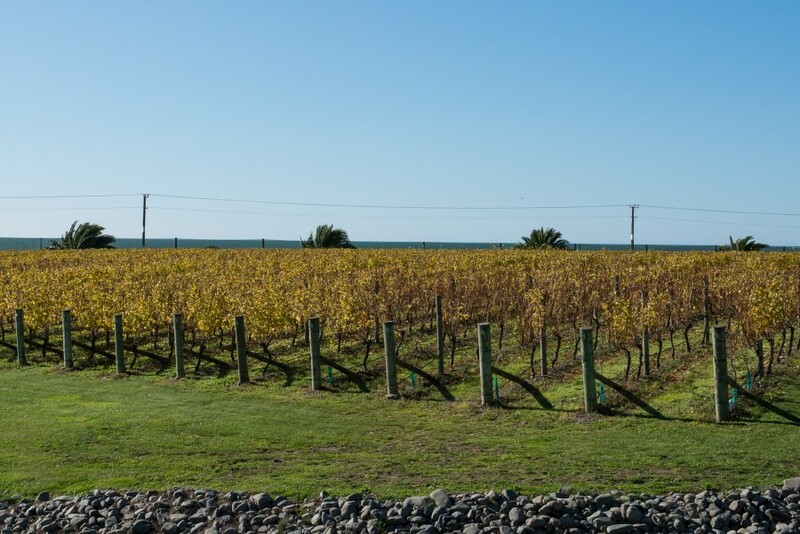 It kicks off with a launch party at Craggy Range Winery on 1 November and finishes with the Carnivore Carnival at the Hawke’s Bay Races on 10 November. 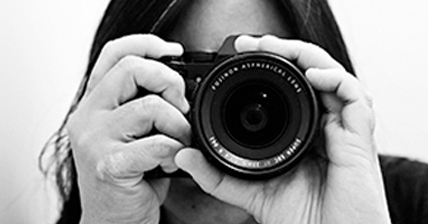 Find out more about F.A.W.C! – tickets on sale now.